Community Health Center Growth and Sustainability: State Profiles from the Northeastern and Mid-Atlantic United States. Increasingly, community development financial institutions (CDFIs), commercial lenders, governments, foundations and others are recognizing the value of investing in CHCs to help them expand capacity and fulfill their mission. To make sound decisions, investors consider numerous factors. While many are specific to the individual CHC, the state environment in which each CHC operates plays an important role in its financial operations, capacity for growth and long term sustainability. 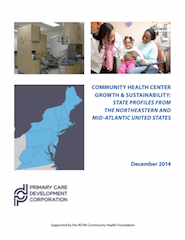 The Primary Care Development Corporation (PCDC), with support from the RCHN Community Health Foundation (RCHN CHF), has prepared Community Health Center Growth and Sustainability: State Profiles from the Northeastern and Mid-Atlantic United States to help investors and other stakeholders better understand the CHC operating environment in 14 Profiled States.